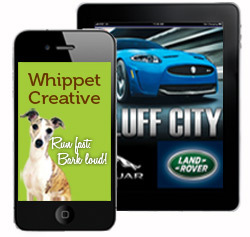 Whippet Creative develops creative and unique websites that get results. Developing an effective website takes experience, practice...and a good handler. execute a website, brand or idea that works to fetch the best results. Our experience as web-based business entrepreneurs gives us a unique perspective on developing websites that promote functionality, statistical tracking, social media, data capture and New Media opportunities -- giving your company a powerful marketing edge over mere "web designers". At the start of each project we offer up to three concept home page options for review. Once approved, we work toward completing important milestones along the way, until your website is finished and you are happy with the results. t's important to ask yourself “What does my site look like on a smartphone?” Mobile web browsing on smart phones is quickly overtaking traditional desktop browsing. By not having a mobile-friendly website, you simply can’t be sure about what opportunities you’re currently missing. A glance at your analytics will give you a good idea of how much of your audience is viewing your site on mobile devices. Mobile web design optimizes your website for viewing on a wide range of mobile devices and smart phones. Ready for a mobile site? Whippet Creative's websites are optimized for SEO from the start to work efficiently with text and link spiders continually prowling your site. Before starting your website, we'll research your industry, your company, and most importantly, your marketing goals. Then, we’ll develop a website that is "primed" for the search engine ranking systems. We handle all the Metatags, Descriptions, Keywords and other SEO to make your website rank higher. Easy-to-use Content Management Systems that will make your tail wag. Managing your website's content is dog-gone easy. We can program a CMS into your website that will allow you to take control of your site, without relying on expensive web geeks or IT departments. Our easy-to-use WYSIWIG content management system allows easy management of copy content, video, graphics and more -- all without damaging the integrity of your website's layout. Track your site's stats like a whippet after a bunny. Whippet Creative builds real-time statistical tracking into your website that provides you with vital information about web traffic. Drive targeted traffic, track conversions and generate reports for evaluating the effectiveness of your site. Email Marketing never sounded so good. Whippet Creative is the developer of MailSpeek® -- a unique and effective email marketing campaign tool that can use YOUR VOICE to communicate with customers. Unlike traditional newsletters, our online e-newsletters reach your customers in seconds, allowing you to quickly communicate the latest news. Visit MailSpeek.com to learn more and to request a demo. Facebook and Twitter are powerful marketing tools that can help promote your company on the internet. The Internet Marketing team at Whippet Creative helps your company learn new tricks for navigating the world of social media to help drive traffic and potential revenue to your site. When it comes to developing and positioning a unique brand identity for your company, Whippet Creative can help you make your mark with professional and creative logo design, brand development, business cards, stationery, signage, vehicle graphics and more. Whippet Creative's award winning graphic designers help you reach your target audience with creative and effective print advertising such as brochures, catalogs, annual reports, advertising campaigns, outdoor advertising, trade show displays and other print collateral.